Just for the fun of it, I’m going to post occasional stitch patterns in honor of geeky days on the calendar. So what is Tau Day? Tau is a constant twice as big as pi, and it is apparently more useful than the number pi. 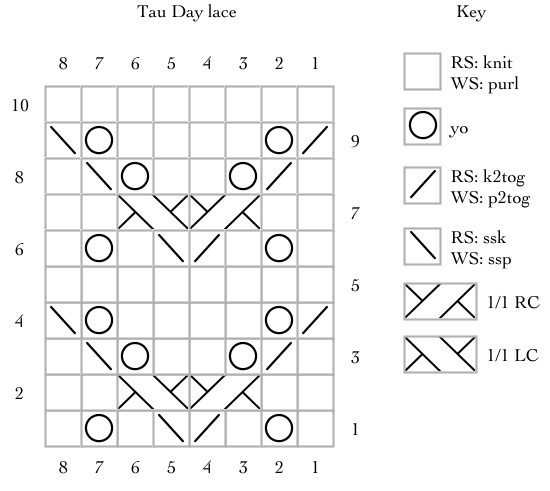 Here is the Tau Manifesto for your mathematical pleasure. The main thing for my purposes is that 6/28 is a date that approximates Tau. Therefore, I have encoded 628 as charts for lace knitting, knitted cables, and a grid for use in any craft that can use a grid as instructions. (This is not, of course, all of Tau; it just seemed like a useful stopping point. 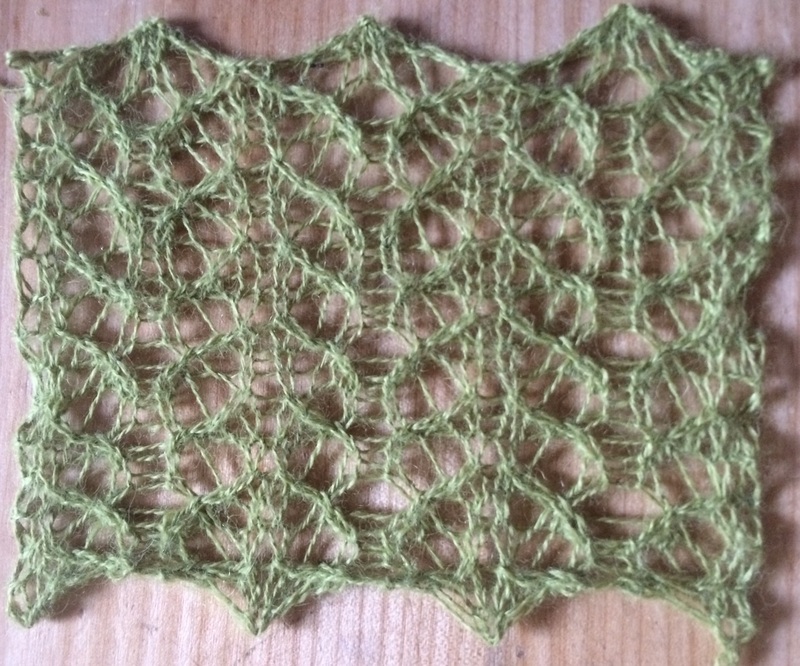 I’ve written this lace pattern to be lace every row (though it’s on the easier end – none of the decreases are worked directly over any of the yarnovers). Alternating plain rows could be added easily – go for it! This is a stitch pattern such as might be found in a stitch dictionary. It is not a pattern for a finished object. You will need to add selvedges or some other form of knitted stitches to either side. Designers, please feel free to use this stitch in your patterns. I’d like credit but won’t be offended if people don’t give it. Row 2 (WS): p2, 1/1 LC, 1/1 RC, p2. Row 3: k1, k2tog, yo, k2, yo, ssk, k1. Row 4: ssk, yo, p4, yo, p2tog. Row 6: p1, yo, p1, ssp, p2tog, p1, yo, p1. Row 7: k2, 1/1 RC, 1/1 LC, k2. Row 8: p1, ssp, yo, p2, yo, p2tog, p1. Row 9: k2tog, yo, k4, yo, ssk. 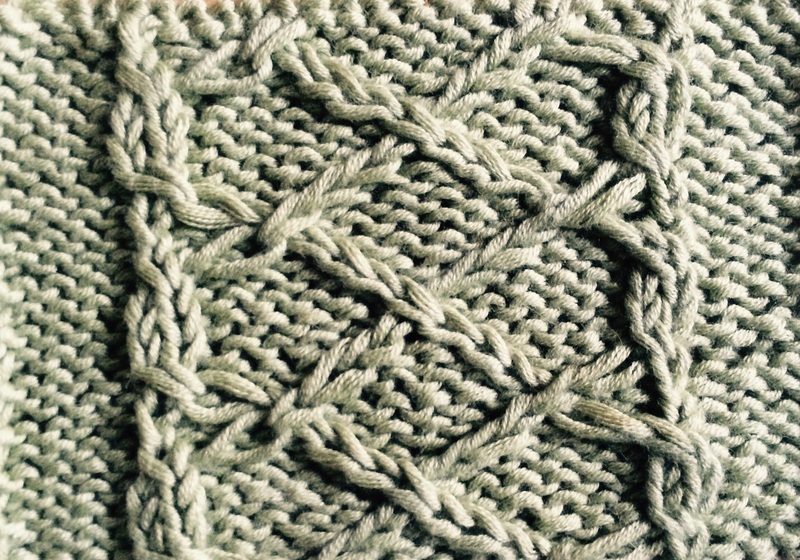 This is a stitch pattern such as might be found in a stitch dictionary. It is not a pattern for a finished object. Tau cable is a repeat of 26 stitches and 8 + 2 rows. 1/1 LC: Slip next stitch to cable needle and place at front of work, knit 1, then knit 1 from cable needle. 1/1 LPC: Slip next stitch to cable needle and place at front of work, purl 1, then knit 1 from cable needle. 1/3 LPC (wrong side row instructions only): Slip next 2 stitches to cable needle and place at front of work, purl 1, then knit 2 from cable needle. 1/1 RC: Slip next stitch to cable needle and place at back of work, knit 1, then knit 1 from cable needle. 1/1 RPC: Slip next stitch to cable needle and place at back of work, knit 1, then purl 1 from cable needle. 1/3 RPC (wrong side row instructions only): Slip next stitch to cable needle and place at back of work, knit 2, then purl 1 from cable needle. Row 1: P4, k1, p3, 1/1 RC, p6, 1/1 RC, p3, k1, p4. Row 2: K4, p1, 1/3 LPC, 1/1 RPC, k4, 1/1 LPC, 1/3 RPC, p1, k4. Row 3: P4, 1/1 LC, p4, 1/1 LPC, p2, 1/1 RPC, p4, 1/1 LC, p4. 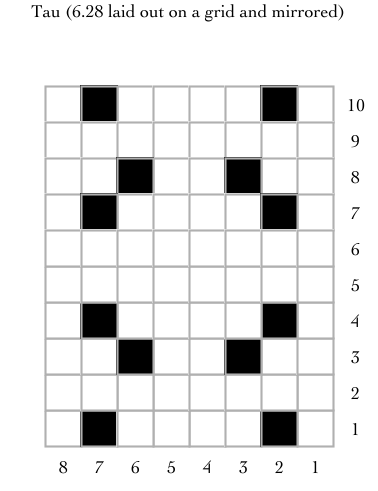 Row 4: K4, p2, k5, 1/1 RPC, 1/1 LPC, k5, p2, k4. Row 5: P4, k2, p6, 1/1 LC, p6, k2, p4. Row 6: K4, p2, k5, 1/1 LPC, 1/1 RPC, k5, p2, k4. Row 7: P4, 1/1 LC, p4, 1/1 RPC, p2, 1/1 LPC, p4, 1/1 LC, p4. Row 8: K4, p1, 1/3 RPC, 1/1 LPC, k4, 1/1 RPC, 1/3 LPC, p1, k4. Row 10: K4, p1, k3, p2, k6, p2, k3, p1, k4.